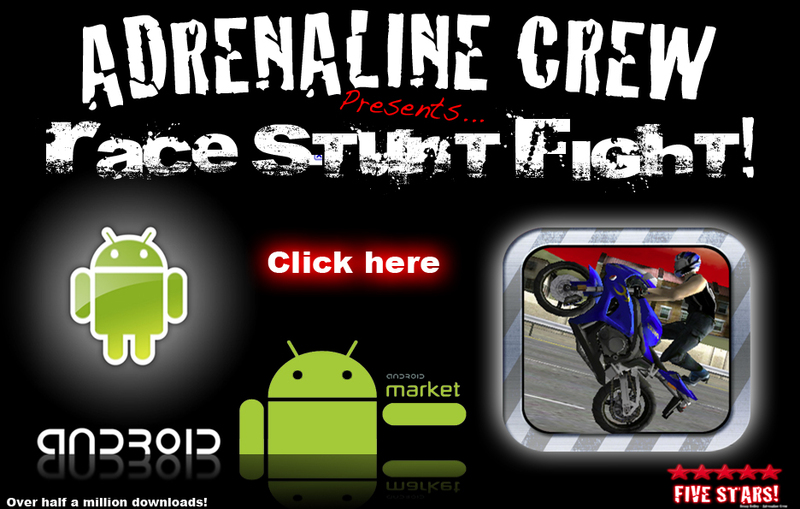 Adrenaline Crew Presents: Race Stunt Fight! After years of wanting a real knock down stunting and fighting video game, we decided like everything else the Adrenaline Crew stands for, we would just do it ourselves! Now is your chance to play the all new Adrenaline Crew “RACE STUNT FIGHT!” game available to you on your iPhone, iPad or Android device! Not since road rash has a racing game been this exciting. Race, stunt and fight your way across America on your motorcycle. 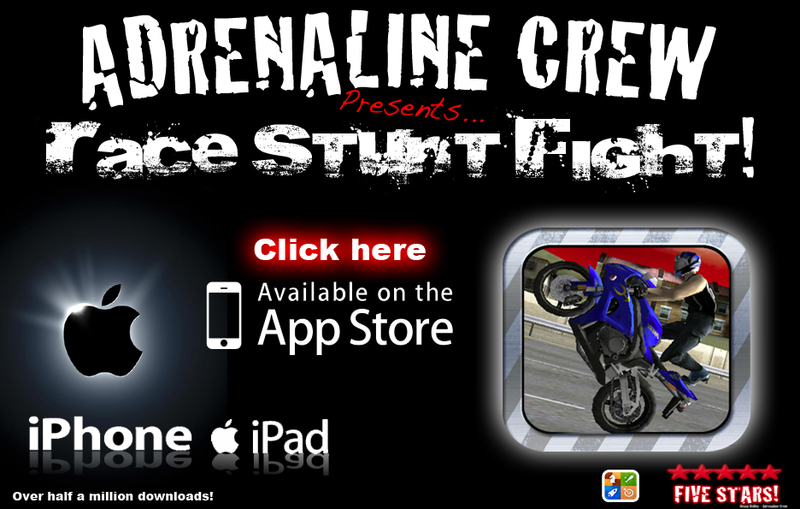 Play as a member of Adrenaline Crew, sport bike rider, cop or Chopper rider as you gain points completing stunts and finishing first. Points are awarded for the top 3 places in the race and stunt bonuses are bigger the longer you can hold the trick before running out of road or getting knocked off the bike. The more points you get, the more levels and motorcycles you can unlock! Every new bike you unlock is faster, handles better and the rider who comes with it gets to unleash more technical stunts, longer turbo and sharper turning. Gamers across the board will fall in love with this easy to control wheelie machine. With weekly updates to add more features, bikes and levels this game will never get boring. Play with your friends or post up your scores directly to facebook or the leader boards! 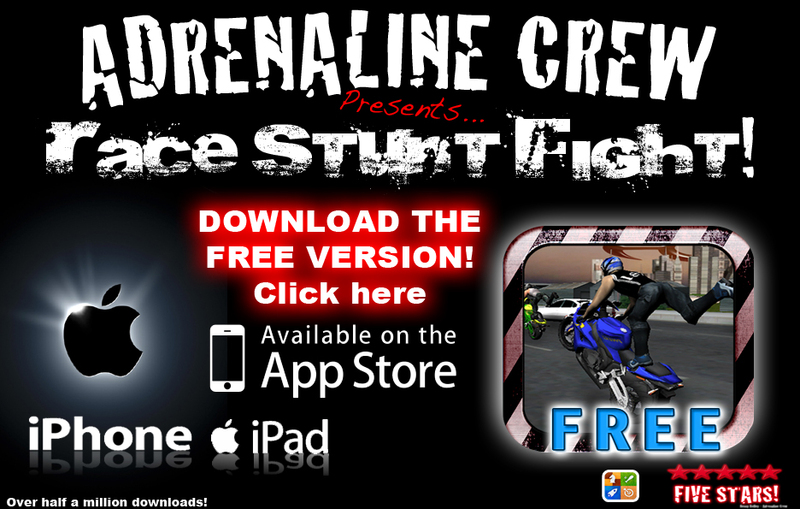 Filling the void of the long lost Road Rash® series, Adrenaline Crew has digitized their insane real life street bike antics to fit safely into your phone. Play as a street bike stunt rider, a road racer or unlock the police officer and Harley riders to battle for first place while dodging traffic, cops and rival riders. The game starts out with the crew blocking off a highway to let you show your skills, but don’t think they are just going to watch as they pull wheelies past you and attempt to knock you off your bike. Once you surpass the hazing you will unlock your first level and round of characters to be on your way. Adding to the fun are the stunt bonuses which you receive for knocking opponents off their bikes. Watch out for traffic as you hit turbo or tap the brake for fun to pop the motorcycle up for a super long nose wheelie! – Pick up Nitro’s to earn an extra boost. – Tap break to avoid wrecks and sticky situations, bike will automatically do an endo! * New Menu buttons and layout for all iphones itouch and ipads. * In App Purchasing to be able to unlock all Levels! * In App Purchasing to be able to unlock all the BIkes and riders! 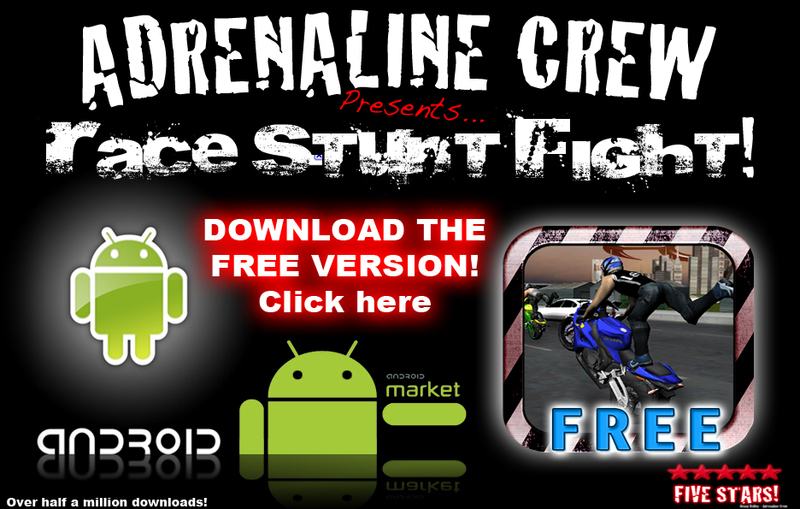 * Added Link to Free Version of Race Stunt Fight! – If being attacked on the side that a cop is shooting radar don’t hit the rider off till you pass the cop, he will go after the other guy instead!